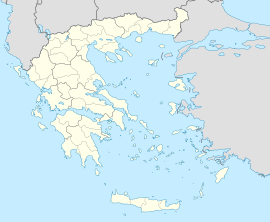 Amyntaio (Greek: Αμύνταιο, before 1928: Σόροβιτς - Sorovich) is a town and municipality in the Florina regional unit of Macedonia, Greece. The population of Amyntaio proper is 4,306, while that of the entire municipality is 16,973 (2011). On March 4, 2007, an unknown civilization around four lakes that lasted from 6000 BC to 60 BC has been uncovered in two important excavations of a Neolithic and an Iron Age settlement in the Amyntaio district of Florina, northern Greece. A 7,300-year-old home with a timber floor, remnants of food supplies and blackberry seeds are among the findings in a Neolithic settlement near the lakes of Vegoritida, Petres, Heimatitida and Zazari. Garments, women’s fashions and burial customs in northern Eordaia 3,000 years ago are coming to light among the hundreds of funeral offerings in a forgotten necropolis dating from the Iron Age in western Macedonia. More than 100 years after the excavation at Agios Panteleimonas in Amyntaio in the Florina prefecture – known in the bibliography as the Pateli Necropolis – by the Russian Archaeological Institute of Istanbul, a systematic investigation of 12 tombs by the 17th Antiquities Ephorate has found a total of 358 tombs dating from between 950 BC and 550 BC. Although the first discovery in 1898 of 376 graves produced many findings, now in the Istanbul Museum, the necropolis between the lakes of Heimatitida and Petres has revealed hundreds more graves. Amyntaio station is a railway junction, where the line to Kozani branches off from the Platy-Florina main line. The municipality has an area of 589.369 km2, the municipal unit 249.852 km2. Official website of Amyntaio Municipality (in Greek).